This is my first time doing Life of a Blogger, which I've seen a lot of my favorite book bloggers do. 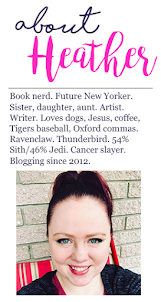 I'm trying to stray further away from tons of promotional posts and more towards talking about books I love, reviewing books (those I've received for review and purchased), and also just talking about life a little bit, which is why I love the idea behind Life of a Blogger. And this week's topic -- my future plans -- is one that I actually have a somewhat interesting answer to. I've never been a very indecisive person. I've always known what I wanted in life. From an early age, I knew that I loved to write and wanted to be a writer. In high school, there weren't a lot of writing classes or opportunities for something like that, so I naturally gravitated towards the newspaper, which I was the editor-in-chief of, and in my graduating year (2004), I was named one of the top 10 student journalists in my home state, Michigan. When I went off to college, that was my goal. But I've also always been really artsy and musical and my first love, long before I was a writer, was ballet. I intentionally stayed at a college nearby home because it was only 20 minutes from my dance studio. I didn't go into college planning to become super involved with dance at my school, but when I realized how many hours I was already spending in the studio a week and NOT getting graded for all my hard work when I could be, I decided it wasn't a bad idea. I auditioned for the dance program at my school hoping to be accepted as a minor, but I actually got accepted for a major and there was some scholarship money available to students who were majors, so I picked up a second major. Alongside my journalism major, I was also pursuing an honors degree, and minors in political science and history. At the time, I was hoping to either audition for a company of some sort when I graduated or be a political correspondent. But during the summer of my sophomore year of college, the constant deadlines (sometimes four and five deadlines a day) really started to wear thin on me. I wasn't enjoying the writing part anymore. All I was really enjoying was the part where I designed the newspaper. I didn't want to leave college hating writing and essentially pursuing a career doing something that made me nauseous with anxiety. So mid-summer, I dropped the major and picked up a graphic design major. I worked towards that degree and dance for about a year and a half. I loved the art classes, but I hadn't really gotten into the actual graphic design classes yet, and my school didn't offer any "life experience" credit and also wouldn't evaluate my portfolio, which I'd been building since high school. During my sophomore year, I had started getting sick really frequently. I got a flu and pneumonia shot early in the semester, got sick almost immediately, and had a horrible case of double pneumonia by Christmas. From there, my health just went further down and I also started accumulating injuries that I couldn't really explain. I'd wake up one morning with a blue and swollen ankle, but not knowing what I'd done to get this kind of injury. At the beginning of what should've been my first of two senior years, I went to see an orthopedic surgeon for horrible shoulder and back pain that I just couldn't soldier through. An MRI showed a small tear, so we scheduled surgery and expected to be able to fix it. Unfortunately, when he opened up my shoulder, he found that the bone (my upper arm) was completely dislocated from my shoulder. The socket wasn't even holding any of it in anymore. He could move the bone across my chest with no resistance from my shoulder whatsoever. He ended up having to rebuild my shoulder from the inside bone to the outside muscles. I ended up having to pull out of the semester of school because I was in so much pain and couldn't drive. It was also my dominant hand and I had to be in an immobilizer for 16 weeks because it was so unstable. I underwent four months of physical therapy before having MRIs done of all my problem joints and my spine to find that many of my joints were in the same condition and I would need a dozen surgeries to repair everything, plus further surgeries later on to maintain my joints after they were repaired. It turns out I have a rare connective tissue disease in which my body doesn't produce enough collagen, so my joints stretch out, but they don't go back. Since my first surgery in 2008, I've had eight surgeries. I can't dance anymore and I was already behind on my graphic design degree. I was essentially back at square one. On top of this, I had also developed a very weak immune system. I tried to continue my education elsewhere, but I found myself really conflicted about what I wanted to do. I did work a couple of internships in marketing and communications, where I could also do some graphic design and felt like I was kind of finding my way, slowly. Then this summer, after being extremely sick for a long time, blood tests showed that my white blood cell count was elevated to a critically high level. Not long after, I was diagnosed with Chronic Myeloid Leukemia. The good news was that they caught it early, started treating it almost immediately, and my blood counts have normalized. Unfortunately, because it is a "chronic" disease, it will never completely go away, at least not until a better treatment is found that can eliminate the mutated genetic material that causes the disease in the first place. But before I got my diagnosis this summer, I'd also spent about ten days in New York City, going to my very first BEA as a new blogger, something an author friend of mine had encouraged. Being in New York City was like the mothership had finally called me home. These were my people, with the Starbucks on every corner, with a strong literary culture. It had been a dream of mine to go to NYC my entire life and it was scary taking a train into a huge city, all by myself, and using AirBNB to stay in the apartment of people I'd never met, but it was a risk that was well worth taking. I found myself there, in the heartbeat of the city, and I never wanted to leave. Finally everything clicked -- I would work in marketing and communications, in publishing, in New York City. When I think about it now, I really feel like it was the universe guiding me to my NEW big dream, my new goal and inspiration, so that I'd have something I was working towards while I fought cancer. More than ever, I finally have something to really fight hard for, because this is a future I'm excited about -- and that hasn't been true for so long. I'm a long way from being able to move to NYC. I still need to be here in Michigan for at least another 18 months to finish treatment and because I am starting almost from square one on my degrees, I need some time here. My goal is to get my associate's in graphic design from a community college so that I have a way to support myself. I also want to start taking transferable classes that could go towards a degree earned either here in Michigan or a school in NYC. I haven't made my mind up on that yet. I have my own business with Mary Kay. I haven't been able to work it since just before I was diagnosed because I've been sick, but I'm hoping to jump back into that soon. I want to save up enough money to pay for an entire year's rent and six months of living expenses before I would even consider a move. It's more than possible with Mary Kay, but so much depends on how I feel, because even though I'm doing much better, this winter has been hard on me and people with leukemia have a very compromised immune system for a long time. Sixty percent of the time, I have a good day, but 40% of the days are really rough on me. So my expenses, wherever I can get some scholarships, and my treatment plan are what will determine where I finish school. But with my Mary Kay and a graphic design associate's, I should be able to save up a lot of money and also be able to support myself in NYC whenever I move there. Logically, it will probably be at least 2-3 years before I would be able to go, possibly longer. Something else I have to consider is that because I have leukemia, I can't have some of those surgeries for my connective tissue disease that I really need. I'm walking on a torn ACL, a knee that badly needs replacing, and have a whole host of other joint problems. It will be awhile before those surgeries would be safe for me. I'll want some of them before I go. As much as I wish I could rush through getting there, I'm just glad that I have a goal I'm passionate about. I'm sure it's why I'm doing so well with my cancer treatment -- because I have something I'm fighting for and won't give up on. I have a purpose. The only truly difficult part about my future plans is the fact that my dad is not really supportive of it. My mom told him halfway through my trip this past summer that she was sure I was going to want to move there and since she did, it's become a taboo topic around the house. My dad has always been so supportive of me, but he's also incredibly protective, and I am a daddy's girl. For a long time, I thought I might move to California after I graduated to be with my sister (who is really my big sister from my sorority, but I really consider her to be my real sister -- we just took awhile to find each other), which he didn't like, but he was somewhat okay with. But he's not even a little okay with New York City. He never asked me how my trip went, I was on ABC's talkshow The Chew while I was there and he won't watch the recording of my being there, and the other day, he told me he thought it was a stupid dream. I think he's really just super worried. But I wish he would ask me more questions about it instead of handing down a judgment. It's not something he likes me to bring up, so I just wish he would so I could talk to him about the whys and the hows and the plan. The person in the world I care most about pleasing is my dad. My mom and brother are really supportive. They both understand that this is the ideal field for me and also that it's really the best place to live if I don't want to be stuck in a dead end job. The room for the most growth in publishing is in New York City. They're both happy that I've finally bounced back from my setbacks and found a new dream. So ... this was a super long post and those are my future plans. What are your future plans? *hugs* Heather!!! Your post made me so sad for you. , especially when you talked about how you love dancing, but then you found out you had the connective tissue disease and you couldn't dance anymore. :( I can't imagine what it must have felt like for your dreams to be taken away from you like that. And then the Leukemia! It's sad because I met you at BEA and ever since I heard you got diagnosed, I kept remembering how we talked and hung out at BEA.. then I imagine how you must have gotten diagnosed just a few weeks later. It breaks my heart! Wow Heather, what a courageous and inspiring story! I'm so glad that your treatments are going well for you and that you have such an amazing dream to work toward! I really hope you get to move to NYC. I took a trip there my senior year of high school and it truly is a magical place. I fell in love with it too. I'm so sorry that you're not able to dance anymore. I can't imagine what that's like to be able to do something like that and suddenly not be able to anymore. You've been through such a tough time but it seems like you're still positive about your life and the goals you have. I truly hope that your dreams come true! And hopefully your dad will come around eventually. Wow, what a story. I'm glad treatments are going well for you right now, and I'm so happy for you that you've found your dream job! I would love to visit NYC one day, and your post just makes me want to go there more. Good luck with everything--I know you'll find a way to make all your dreams come true! Oh my gosh, you've been through so much! I'm glad you figured out what you want to do (and yay graphic design! ), and I hope you achieve all of your goals Heather!